Julie: As I approached the front door, I heard a noise in the bushes and saw a big dark person crouched, moving underneath the kitchen windows, then going to the trees on the other end of the driveway. Dr. Vrechek: What did this figure look like? Julie: Crouched, big, dark, maybe a hood, carrying something in his left hand. At the time, Julie was less than alarmed by this stranger's presence due to the fact it was "Hacking Night"--the night before Halloween, when children traditionally play pranks and cause other mischief around the neighborhood. She did recall thinking it odd, however, that this individual was unaccompanied, as young people typically cavort in groups on "Hacking Night." Dr. Vrechek: Bigger than yourself. Okay. Was it a man or a woman, or a girl or a boy? Julie: I would just say a man or a boy. This general description could match either Michael, Tommy, or Ken. Julie tells us that she caught the last ten minutes, or so, of Ellery Queen. Hence, if we accept Tommy's recent confession as entirely truthful, he would have still been still engaged in a sexual encounter with Martha Moxley behind the house at this point. Mark #3 10:05 pm Julie also tells us that soon after Ellery Queen concluded, at 10:00 pm., she encountered Ken Littleton in the kitchen, making a sandwich. 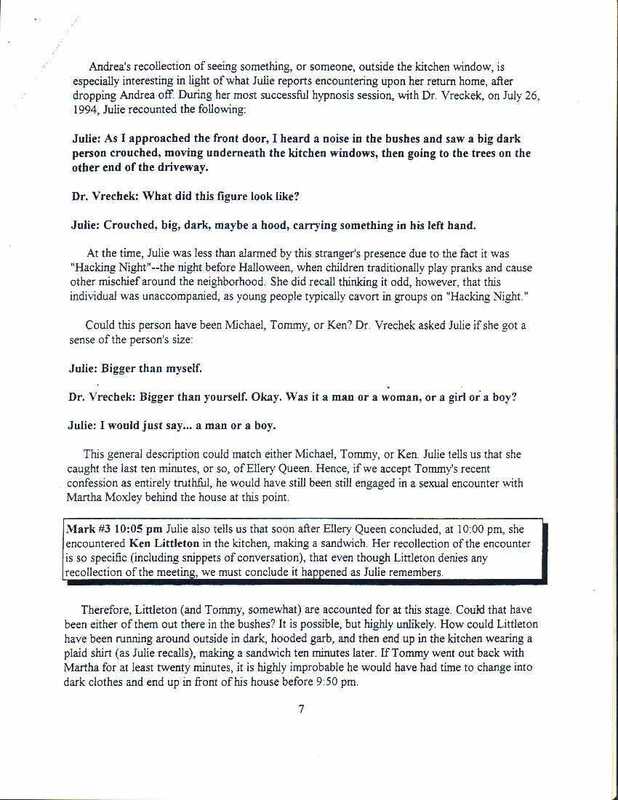 Her recollection of the encounter is so specific (including snippets of conversation), that even though Littleton denies any recollection of the meeting, we must conclude it happened as Julie remembers. Therefore, Littleton (and Tommy, somewhat) are accounted for at this stage. Could that have been either of them out there in the bushes? It is possible, but highly unlikely. How could Littleton have been running around outside in dark, hooded garb, and then end up in the kitchen wearing a plaid shirt (as Julie recalls), making a sandwich ten minutes later. If Tommy went out back with Martha for at least twenty minutes, it is highly improbable he would have had time to change into dark clothes and end up in front of his house before 9:50 pm.